I am very excited to announce a new aspect of ModPo that I hope will intrigue you and perhaps induce you to participate. We have created a new section of ModPo that parallels the main ModPo syllabus, "chapter" by "chapter" and week by week, and offers links to short video recordings of ModPo people around the world gathered in small groups conducting collaborative close readings of our poems — and related poems — themselves. Yes: we are now calling for crowdsourced collaborative close readings. —and have a look. There are already a few videos linked there. To prepare for the full release of a wide range of these videos for ModPo 2015 (which starts on September 12, 2015), I am calling on any and all ModPo people to organize small groups—together near where you live (in a "meet-up") or in some way remotely/virtually—and film a ten- or fifteen-minute discussion of any ModPo poem or a poem by one of the ModPo poets you deem relevant to our discussions and themes. This is a new section of ModPo, in progress. 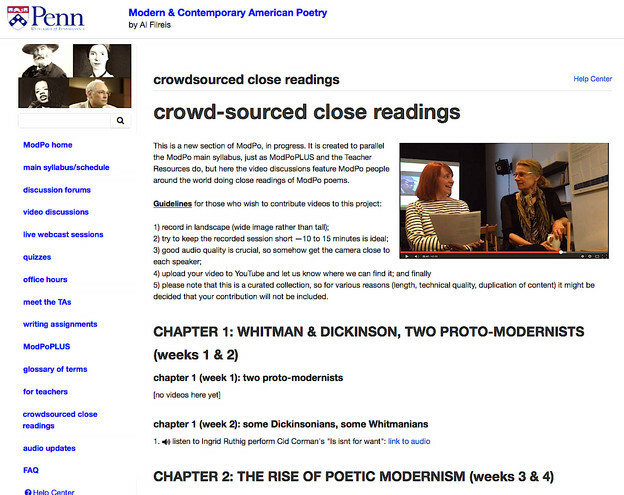 It is created to parallel the ModPo main syllabus, just as ModPoPLUS and the Teacher Resources do, but here the video discussions feature ModPo people around the world doing close readings of ModPo poems. 5) please note that this is a curated collection, so for various reasons (length, technical quality, duplication of content) it might be decided that your contribution will not be included. Once you've uploaded your video, please let us know by writing to modpo@writing.upenn.edu . I'm very excited about this new potential for diversifying and further democratizing our poetry community, and hope you are excited too. So put away your modesty and try to make a video just like the ones I and the TAs have made! Take it from us: it's fun and edifying. As of today already, there are 5,000 people signed up for ModPo '15. If you haven't re-enrolled, please consider it and here is the link: https://www.coursera.org/course/modernpoetry .